It is with great sadness that we learned of the death of our colleague and friend, Peter Wellstead, who passed away suddenly and unexpectedly at his home in Manchester last Friday, 24th June 2016. Peter had a profound influence on the field of control engineering over many years. 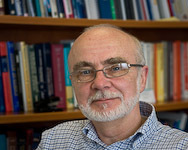 More recently, he made significant contributions to the emerging area of systems biology, establishing a team at the Hamilton Institute in 2003. His primary research focus in latter years was on the development of a systems understanding of Parkinson’s Disease with a view to helping others. This was entirely consistent with Peter’s general disposition; he was a generous, kind and supportive mentor, colleague and friend. He will be sorely missed by all who knew him. The 2nd Interdisciplinary Workshop on Data Privacy will take place at the Maynooth University Hamilton Institute on the 28th of September, 2015. Details on the event can be found at the workshop website . The Eolas Building is situated between the Bioscience & Electronic Engineering Building and the Iontas Building on the North Campus. See interactive map. Please use the Front Entrance for direct access to the 3rd floor. The TGI module “TGI_M05: Optimization based congestion control and networking” will run from May 26th to May 30th, 2014. The module will be delivered by Prof. R. Srikant of the University of Illinois at Urbana-Champaign and classes will run from 9.30am-12.30pm and 2pm-4pm each day. The venue for this module is the Hamilton Institute seminar room. More information is available at the Hamilton Institute structured PhD page . The TGI module “Network Dynamics” has been rescheduled and will run from April 29th to May 9th (excluding weekend and bank holidays). Lectures will take place in the Hamilton Institute seminar room from 9.30am to 12.45pm each day. More information is available at the Structured PhD webpage . At long last, work has started on the new ICT hub building. Part funded by a PRTLI 5 award, this will provide new purpose-built accommodation for the Hamilton Institute. The Hamilton Institute will host the module “Convex Optimization and an Introduction to Congestion Control” as part of the Telecommunication Graduate Initiative (TGI). The module will run from July 23rd to August 3rd, 2012 and will be delivered by Prof. Fabian Wirth. For more details, see the TGI site. Hamilton Institute researchers Robert Shorten and Doug Leith have been awarded major new research funding by Science Foundation Ireland. Speaking at the announcement Director-General of Science Foundation Ireland, Professor Mark Ferguson, said: “The PI projects for 2012, selected following a highly-competitive, peer-reviewed process, are investigating some of the most important issues facing humanity today”. Prof. Robert Shorten (centre) project co-PI in the Hamilton Institute with Prof. Mark Ferguson (left) Director-General of Science Foundation Ireland and Minister Richard Bruton (standing)Transport is a major contributor to climate change and pollution in our cities. Looking ahead, the need is to regulate the aggregate effect of vehicles, e.g. to avoid pollution peaks, manage traffic flow more efficiently while respecting an emissions budget, and regulate electric vehicle load on the energy network. This requires vehicles to be able to cooperate with each other. Much of the technology needed (GPS, smart sensors, city-wide wireless network connectivity etc) will soon be widely deployed and the political will for change increasingly exists. However, the lack of scalable, efficient algorithms for achieving cooperation and coordination, which is the primary technical focus of the new Hamilton Institute project, remains a key technology bottleneck to future developments. The TwinLin project led by Prof. Robert Shorten of the Hamilton Institute featured at the Innovation Ireland Colloquium held in Berlin on April 25th as an exemplar of Irish-German research co-operation. 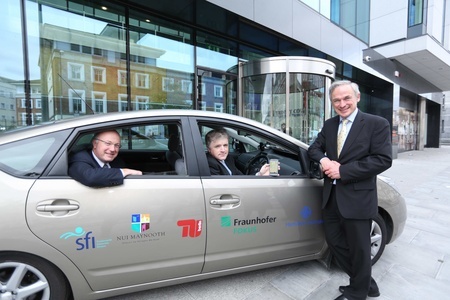 The project is a partnership between the Hamilton Institute, Fraunhofer Fokus and TU Berlin studying smarter ways to use hybrid electric vehicles to manage pollution in cities. For further details on the TwinLin project, contact Prof. Robert Shorten or see the TwinLin project web page. See also SFI press release.